I’m in love with my new pressure cooker. 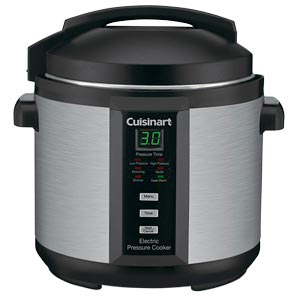 I’d been wanting one for quite a while and when Frieda, Frieda Loves Bread, posted two great tutorials on using the Cuisinart 6 quart electric pressure cooker, and she told me they were selling at Costco for $69, I knew the time had come to buy one. Frieda described the electric pressure cooker as a crockpot on steroids, which is a perfect description. You get the results of a tender, slow cooked meal without the long cooking time. This pressure cooker is great for making Steel Cut Oats because they’re softer than when cooked on the stove. I like the slightly crunchy texture of Steel Cut Oats, but I usually ended up cooking them twice as long as the package directions suggested. Some people recommend soaking Steel Cut Oats overnight to soften them before cooking, but with a pressure cooker that isn’t necessary. Top with milk, fresh or dried fruit, chopped nuts or granola, and your favorite sweetener – brown or white sugar, maple syrup, or agave syrup. This time I chose dried blueberries, strawberries, granola and brown sugar. I cooked in Instant Pot this morning with 1 cup of Bobs Red Mill Steel Cut oats, 3 cups of Almond Milk (no water), 3 tablespoons of Brown Sugar, 1 sliced apple, pinch of salt, sprinkled cinnamon to suit, 1 tablespoon of butter, and olive oil spray for greasing pot. Dump all ingredients into PC, turn valve to sealing, turn on pressure cooker mode to high pressure, go for 12 minutes, allow to for depressurization naturally for about 15 minutes, feel free to use quick release at this stage. Serve with toppings of choice. Enjoy! Try 1 1/2 cups water. 2 cups makes oat soup. Hi Bob – it really depends on how creamy you like your oats and how impatient you are. 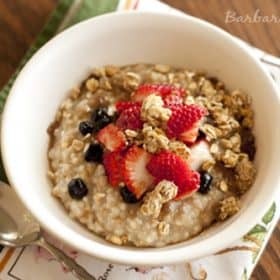 I like using 2 cups and if you just wait a few minutes after cooking with the lid off, the oats absorb the extra liquid and make them extra creamy. But definitely do what works for you. Thanks! It really is the best way to cook steel cut oats. This is just as long as cooking stove top, but I guess the pressure cooker turns self off so you don’t have to think about it while you do your other morning stuff. I just tried it tonite. It is an old post, but I am glad i found it. 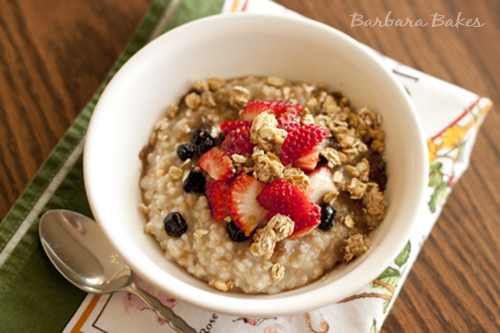 I tried some of the other recipes but I like my oatmeal soft and easy to eat rather than chewy. Mine came out a little too watery. i think I did it right, but can’t be sure. I added a handful of Raisin Brand to soak up the extra water and it added raisins and sugar perfectly lol. If I made a mistake, I hope I do it again because the Raisin bran made it freaking awesome 🙂 If I were you, I would revisit this recipe again, it really is easy and it really is worth it. I made this recipe for hubby using my new Instant Pot pressure cooker. Perfect! Hubby said best steel cut oats he has ever eaten. I used a pat of butter for the oil. After cooking, I sweetened with half a mashed banana, some vanilla, cinnamon, unsweet coconut flakes, and a few almonds sprinkled on top! Yummy! I will double the recipe next time. This made two nice sized servings but it was so good that hubby wanted more and it was all gone! Thanks Sherry! So fun to hear it was the best ever 🙂 Your additions sound delicious!